Last week it was Japan, this week it seems Libya has largely come to dominate the news agenda. Yet even as the camera crews set off for North Africa chasing the latest catastrophe, the death toll in Japan continues to rise - to now more than 21,000 while 180 technicians take huge risks to fight a nuclear melt down. move half way around the world to the people of Japan. wiped away by a wall of sea water. lost accumulated wealth and comfort. at the Fukushima Nuclear Power Plant. as they begin to pick up the pieces. May efforts to stabilize the Fukushima plant be successful. and make peace with their losses. Spring Equinox is a festival of balance, as day and night are equal (but after this the days get longer). It’s also the time when the coming of Spring is really becoming apparent. According to Bede, the ancient Germanic pagans honoured a goddess called Eostre or Ostara who was associated with hares and the Moon and eggs; however there is no reference to this goddess in any other text. 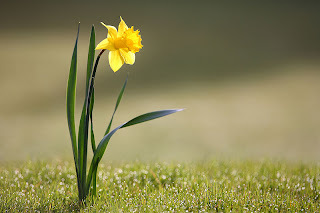 Although Spring Equinox is about the balance between darkness and light, with the light in the ascendancy, an important point about Pagan symbolism is that darkness is not seen as negative, but as a time of rest and renewal and refreshment before the return of daylight. Some people use darkness as a metaphor for ignorance and evil. That symbolism has no place in Pagan ritual. In Wicca, darkness does not symbolise evil. The darkness is necessary for rest, growth, and regeneration. Death is not evil, but a necessary adjunct to life. If there was no death and dissolution, there could be no change or growth. The cycle of birth, life, death, and rebirth is part of the interaction of the polarities. Suffering is also part of the process of growth; just as a tree is shaped by the wind, we are shaped by our experiences. It is only by experiencing suffering that we acquire sufficient depth to know the fullness of joy. It is then that the full light of consciousness dawns in us, and we achieve mystical communion with the divine. Spring Equinox can be celebrated by a tug-of-war between two teams representing the darkness and the light, or by Easter-egg hunts, or by painting eggs. Visualisation is a practice used by many Pagans to explore and transform the inner self. It is derived from the Kabbalistic practice of pathworking (visualising the pathways on the Kabbalistic Tree of Life). Visualising can develop the imagination and be relaxing and gently energising. Start from a high tower in an upper room. Descend ten steps. Walk down the hill on which the tower stands, along a track down to a round cove, where rocky outcrops enclose a calm stretch of water and a smooth slope of sand, and a stream runs down the beach to the sea. Walk to the edge of the sea (you can paddle or dive in, whatever you like) and find something which is meant for you under the water (could be a shell or a pebble, or whatever). When you are ready, return to the shore. Now it is time to return back up the slope, through the fields to the door by which you entered. Retrace your steps up to the door, open it and close it behind you. You can lock it if you want. Then climb back up the steps, and return to the space in which you are sitting. It’s best to use simple visualisations that can be memorised, rather than using a tape. If you buy tapes, first listen to them all the way through without visualising to check you are happy with them. Work out what the purpose of your visualisation is before you start. Don’t take part if you feel uncomfortable with the person leading the visualisation – your instinct is probably correct.